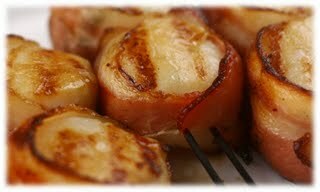 Bacon wrapped and smoked scallops are the best seafood to make as an appetizer to pair with a gourmet meal. The simple ingredients in this recipe compliment the scallops perfectly to bring out the tender meat and succulent flavor. And, since scallops are little bite size pieces, they are quick on the smoker to hold your guests over for the main dish. This smoked recipe will take about 45 minutes on your smoker so make sure you plan your meal accordingly. Light your charcoal smoker approximately 30 minutes, or 10 minutes before with a gas smoker, before you want to start making your bacon wrapped scallops appetizer. Take your strips of bacon and wrap 1 slice around each jumbo scallop. Use toothpicks to secure the bacon around the scallop. Place your bacon wrapped scallops in an aluminum tray or on a sheet of aluminum foil at the same time you place your wood chip foil pouch directly on your charcoal or inside your metal smoker box. The scallops will smoke 45 minutes or until your bacon is cooked to the doneness you prefer. If your bacon is too far away from the heat source on your smoker and doesn't seem to be getting cooked, place your foil pan closer to the heat source for the last 10-15 minutes to ensure it is fully cooked.